5 Bedroom Detached House For Sale in Heathfield for Guide Price £1,750,000. Price Range 1,750,000 - 2,000,000. Available for the first time in 25 years, Hugletts Farm offers an attractive period (unlisted) farmhouse, a holiday cottage and outbuildings with further development potential (STPP) surrounded on all sides by its own land extending to approximately 75 acres (TBV) with the option of purchasing less land by negotiation, set in a semi-rural position with stunning views. The main house is believed to date back to the 15th Century and offers an abundance of character features and flexible accommodation over four floors to include a wonderful wine cellar with curved brick detailing, entrance porch and sitting room with original red brick block flooring and beautiful curved brick inglenook fireplace. Double-aspect drawing room, dining room with inglenook fireplace and a spacious kitchen with breakfast room and utility room. To the first floor there are three double bedrooms and two bathrooms, and a further two double bedrooms and bathroom to the second floor. To the courtyard there is an annex barn conversion (with planning permission to be a holiday let) comprising a large reception room with access out to the terrace overlooking the fields, kitchen, downstairs cloakroom, family bathroom and two double bedrooms. 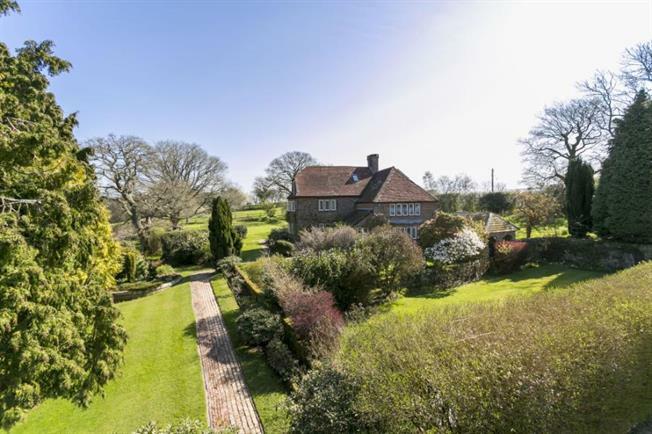 The property is approached via a quiet no-through lane and sits in wonderfully manicured gardens which are a major feature, wrapping around the house on all sides giving a high degree of privacy. The private driveway sweeps past the side of the gardens and into a large courtyard which provides parking for a number of vehicles, flanked on both sides by brick and timber-framed outbuildings extending to almost 3500sqft. The outbuildings comprise a workshop, two storage barns, open barn, tractor shed, two loose boxes and a double open-fronted garage. To the rear of the garden there is a sand school, a large greenhouse and two poly-tunnels. The house is surrounded by its own land on all sides, predominantly comprising of fields and paddocks extending to circa 75 acres in total (tbv). The property enjoys wonderful rural views from all angles and is most pleasantly situated towards the end of a sought after no-through country lane in the small village of Cade Street, next to Punnetts Town. Punnetts Town enjoys a well regarded Primary School whilst the market town of Heathfield with its range of shops, supermarkets and amenities for most day to day needs is approximately 2 miles away. The spa town of Royal Tunbridge Wells and the coast at Eastbourne are within 16 and 17 miles respectively. There are mainline railway stations conveniently located close by at Stonegate (7 miles), Buxted (9 miles), Jarvis Brook, and Wadhurst, all within comfortable driving distance. The district is well served by a good range of state and independent schools together with excellent sporting and recreational facilities including several golf courses, sailing and horse racing.